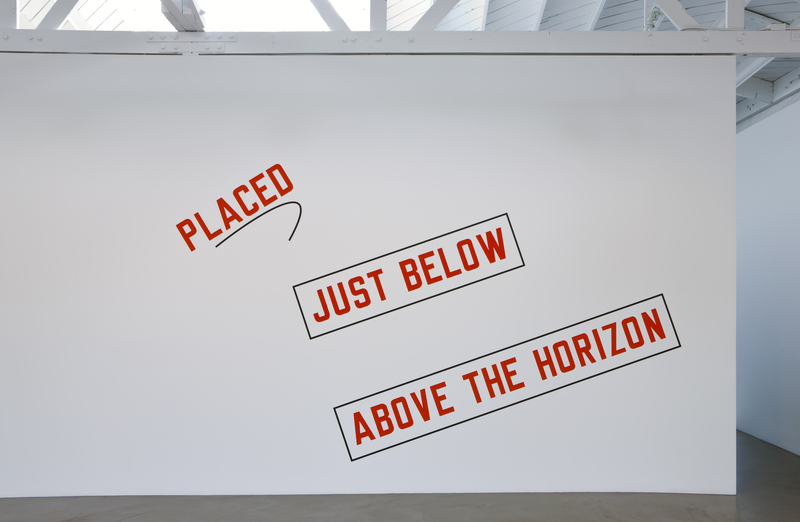 Jeanne-Salomé Rochat, magazine publisher, on a Lawrence Weiner painting. JSR I was attracted by a work that seems to have no function except to tell something that happened, is happening, or will happen somewhere else. What exactly is placed just below, above the horizon? Is it just the word or does it refer to something else? And where is that place? Which horizon? The form is graceful and lyrical, and the content seems ready to be filled up. To me beauty is that. It’s an unknown face, appealing, confusing and it mostly feeds on what’s left over from people around it. GB Weiner says he wants to create works that function irrespective of culture – so is this a universal beauty? JSR Of course I might not have been attracted to this work if it was in a language I cannot understand. I might have noticed that the font is cute, really cute even. Nevertheless, the work might be equally functional if translated, for example, simply through its formalist character. It sounds and looks like it’s talking about itself: the mural (the paint on the wall, in the exhibition space, in the museum building) might be placed, just below, above the horizon. Is it? Or is it not? If it’s both placed just below AND above the horizon, does it mean it can be pretty much anywhere except way below? In all, the work is quite egocentric: wondering about its own location and limits, absorbing the viewers projections and hypotheses. It mostly refers to itself, its form as a frame for people to wander in, a container for them to pile their own things up in, like an empty house. I like that simplicity, that subversive emptiness. The work is unsolved, never finished, unable to die. I welcome that kind of frustration. GB Do you think that Weiner is concerned with beauty? He talks a lot about dignity. He wants to change our perception of the world. Is beauty a part of that in any way? JSR I know that Weiner is concerned with art, sustainability, politics and a myriad of other interrelated themes – and beauty is probably a part of it. I don’t know his personal thoughts on the issue. In my perception, there is a use of formal prettiness to attract the eye, gracious shapes, dynamic arrangements in space, colours. That balance allows the eye to feel at peace, to not panic. This is different from the type of beauty I described before – that’s still connected to form but with the aim of creating desire, or waves of desire, not only desire to look but desire to take part in the work. Beauty is asking to be used. Real beauty endures. It’s a rhythm, a cadence, a sphere of action. So in my mind, that work has the power to change perceptions. GB Do you see a relationship between the beauty of this work and your own work in publishing? JSR I identify with the way Weiner seems to prioritize the value of experience. He produce systems for experiencing culture, for exploring our identity in new ways and it is something I also pursue actively through my own work, Novembre is about examining Swiss culture in relation to other cultures, in a trans-generational perspective, and Sang Bleu is about challenging the borders between definitions of ‘underground culture’ and ‘mainstream culture’ in relation to the human body and its possible presentations, ornamentations and modifications. I am also thinking about something else: in my own culture, and by extension, professional activity, it is often considered so uncool, so obvious, and so kind of gross even – to talk about what is happening in front of our faces – like a typically striking beauty. This can be hard to break out of. It’s like when everything is on the table and everything is so known, to even talk about it is very banal, and simultaneously forbidden. So you end up not talking about it at all. In the work of Weiner, I pick up something similar, an inability to talk about something. I assume that there is a conversation going on but wait a minute, what are we talking about actually? Talking about nothing is so natural sometimes, and we do it so carefully, so innocently. I think that the formalism in Weiner’s work emphasises the taboo, the presence of extremely important and simultaneously ordinary elements in and around it. In my life, I like to enjoy those basic highlights.